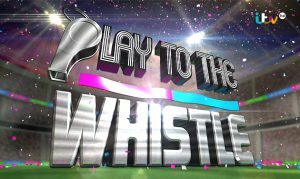 These days, football (read: soccer, not that other sport) star Frank Lampard is working towards a different goal: that is, as a team captain for British panel television show, Play to the Whistle. The show, which airs on ITV, has two teams of three compete for points in rounds of sports trivia, as well as physical games. Recently, the current New York City FC midfielder (whose original claim to fame was with Chelsea FC across the pond) shot a bit for the show right in our neck of the woods, with crew and equipment Atlantic provided. Just as with our previous run-in with another sports great, we used a two-man crew (consisting of a camera operator and sound recordist), which filmed on a Canon C300. During segment, Lampard himself addressed the audience briefly (and directly to camera) as part of an intro to an episode, and then dashed off frame! In the final completed intro, the next shot would be of him in London, dashing back into frame to complete his thought and get the show on the road. Or on the field? You get it.